I was going to put this in as part of the last post, but I think it deserves a post of it's very own. I am really loving this project. And there have been no snags..... so far. This photo pretty much sums up what the project is. The Tim Sale Scarf! 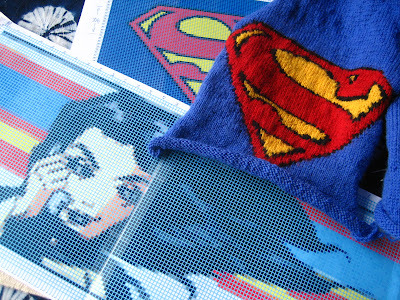 I've finished the Superman 'S' symbol and there is plenty of simple stockinette bus knitting for the remaining length of the scarf. The next step is to start the second side of the scarf. The second side will consist of an awesome Lois Lane graphic from Tim Sale's comic book Superman Confidential, Issue #3 to be specific. This is what my table looked like at 1:30am last night. I had to slow down and figure out which colors/yarns were for what. But all that is sorted now and it should be smooth sailing from here! *fingers crossed* More photos to come! posted by Venus @ 12:03 p.m.
Tim Sale is going to be blown away. Please take a picture before you give it to him. 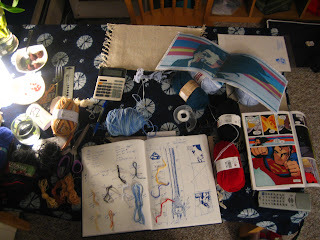 I'm excruciatingly terrified of color knitting. Your Superman S is terric!